A few months ago, Make San Antonio celebrated our one year anniversary. In a little over a year, we feel we’ve accomplished so much as a new start up. From an idea of starting a makerspace to kicking off a membership drive, although our goal didn’t pan out the way we originally envisioned, our plans for the future have been shaped differently because of you! As you’ll read below, we were out in the community quite a bit this past year and we had the opportunity to meet with so many people. During our conversations, we realized that although our grand idea of opening up a makerspace would be cool our community needs something sooner rather than later. As makers we create our own borders. 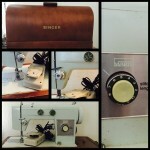 We go wherever our tools take us, and we teach wherever a desire to learn a new skill arises. 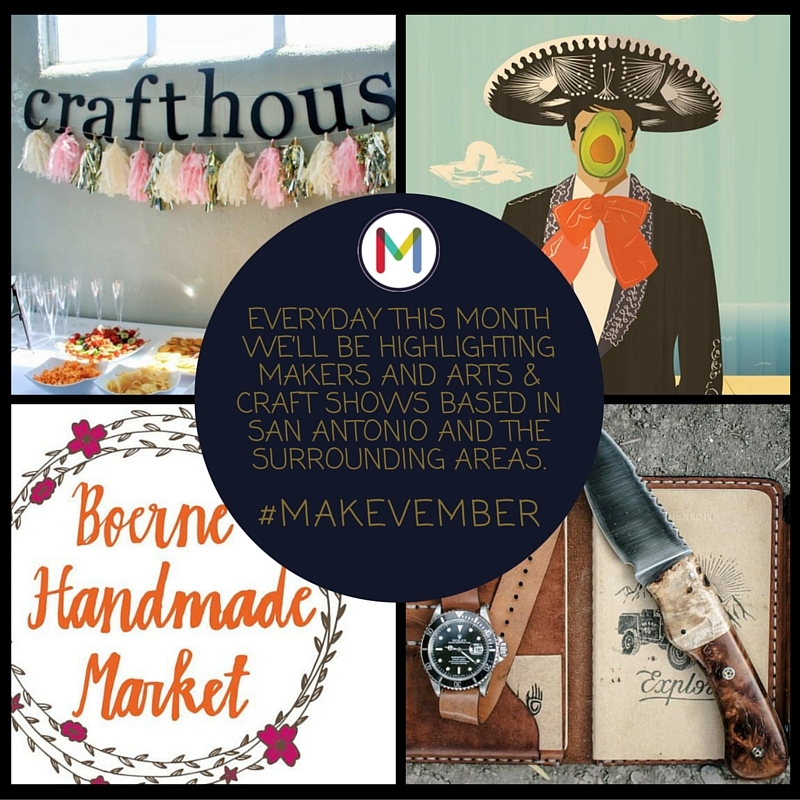 Later on this week, we’ll update you all with how we envision 2016 to look for Make San Antonio. For the time being, let’s reflect on the past year. We kicked off the year by writing an article for the Rivard Report, Make San Antonio: Building a community of makers. We wrote about our journey thus far, and our hopes for the future. On Valentine’s Day we kicked off our membership drive, and spent the morning sharing our vision on-air with the folks from KLUP’s Tech City USA radio show. We also pitched our idea in front of a crowd at Café Commerce’s One Million Pints. 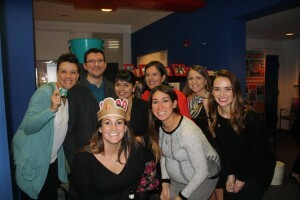 In March, we provided an update of our membership drive, and where we’ve been. We created a video to promote our membership, and pitched at SA New Tech. We not only attended, but also had activities at 2nd Friday at Beacon Hill, SoFlo Market and Artpace Family Day. And, we ended our makerspace drive. We went back to Lone Star Studio (site of our inaugural Makevember event), and held a Second Saturday Makers Showcase in partnership with the Lullwood Group. 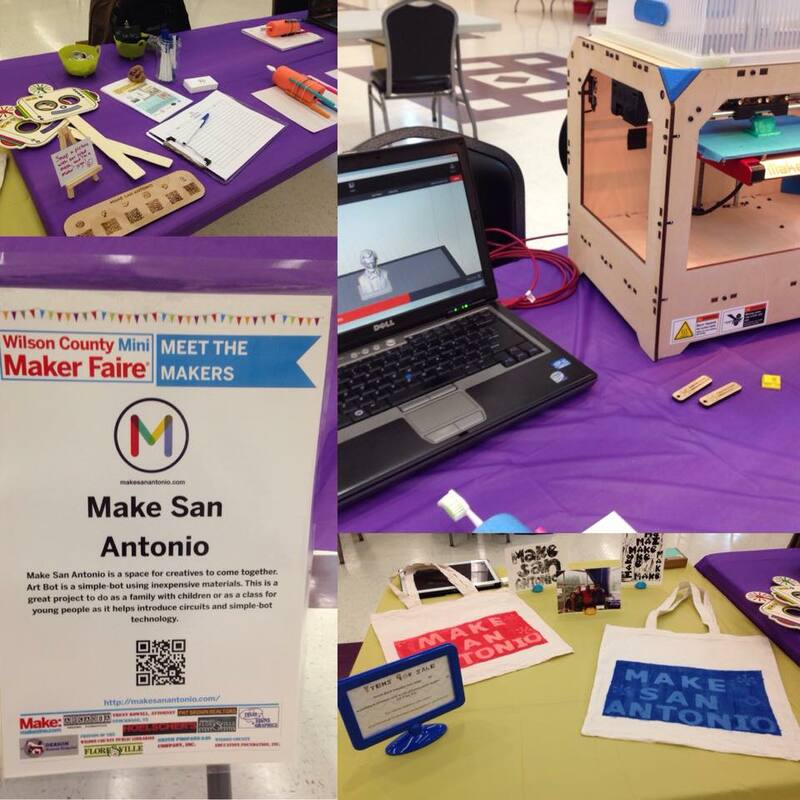 We ventured to Floresville, Texas for the first Wilson County Mini Maker Faire. What a fun bunch of makers! We brought our 3D printer, art bots and makey makeys. 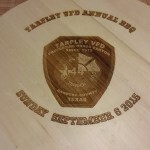 Acquired a laser cutter, and set some time aside to make stuff. We tested out our laser cutter, and created some tokens from upcycled mat board for spare parts annual Fine Arts Fair. We took a brief siesta, and ventured outdoors to make items at home. We were surprised (and, honored) to find our name mentioned in the San Antonio Express-News article, Where San Antonio kids can go be nerds. Acquired a thrifted sewing machine for our craft arsenal. 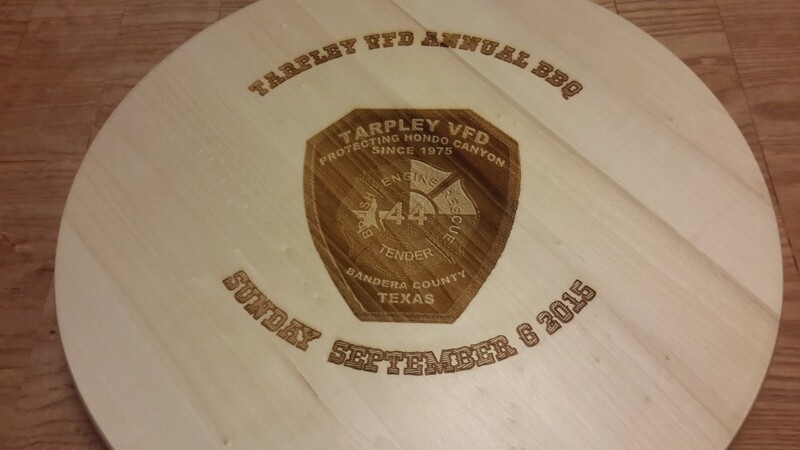 Donated a laser etched Lazy Susan for our friends at the Tarpley Volunteer Fire Department BBQ. Donated some laser etched coasters to our new friends at Crafthouse SA, and we were also interviewed for their Meet Your Maker blog series. This year marked the first San Antonio Mini Maker Faire, and we couldn’t be more excited about the turnout. The San Antonio Public Library’s Central Library hosted the event, which brought out a crowd of 1,100 people. 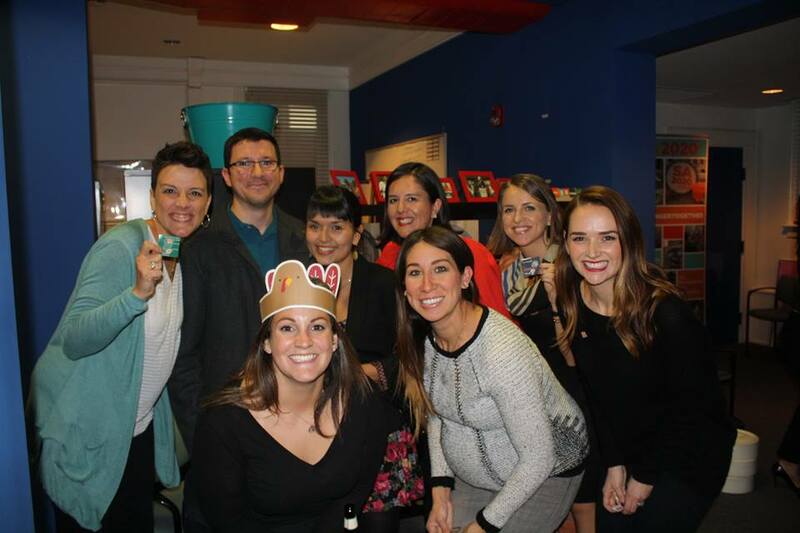 Make San Antonio’s leadership team is part of the planning committee for next year’s faire. 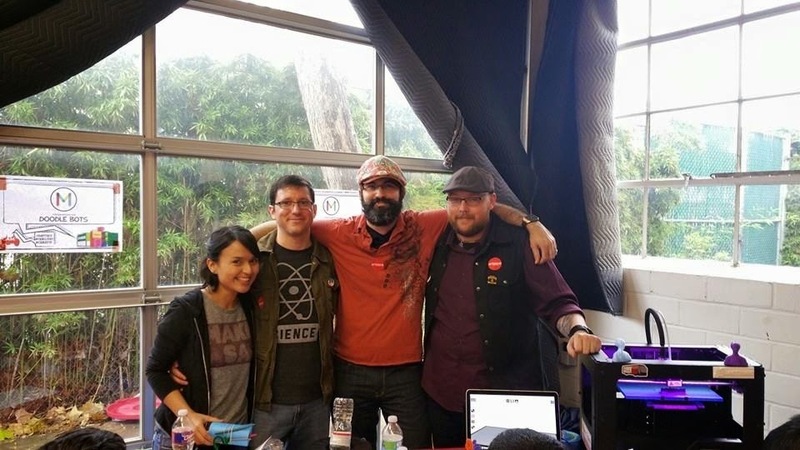 Mark your calendars the 2016 San Antonio Mini Maker Faire goes down March 26. We felt like maker faire pros by the time the Barnes & Noble Mini Maker Faire came along. We set up shop at Barnes & Noble San Pedro Crossing , and hosted a few activities. Although we didn’t host an in-person Makevember event like we did in 2014, we brought it online. Throughout November (see blog round-ups week one and week two), we profiled local makers while encouraging followers to shop local during the holiday season. We were pleasantly surprised to receive an e-mail from someone who was interested in volunteering with Make San Antonio, and was “looking to be apart of a meaningful organization.” This month, we formally introduced Madison Cooper to our team. She’s going to be blogging, and assisting with upcoming events (more on that in our next blog).